Donald Trump is scheduled to return to the Phoenix Convention Center, for what he promises will be a "major speech" on illegal immigration, at 6 p.m. Wednesday, ABC15 has learned. The New York businessman has recently softened his stance on immigration, but it remains to be seen what the crux of Wednesday's speech will entail. Are you planning on attending the @realDonaldTrump rally in Phoenix on Wednesday? 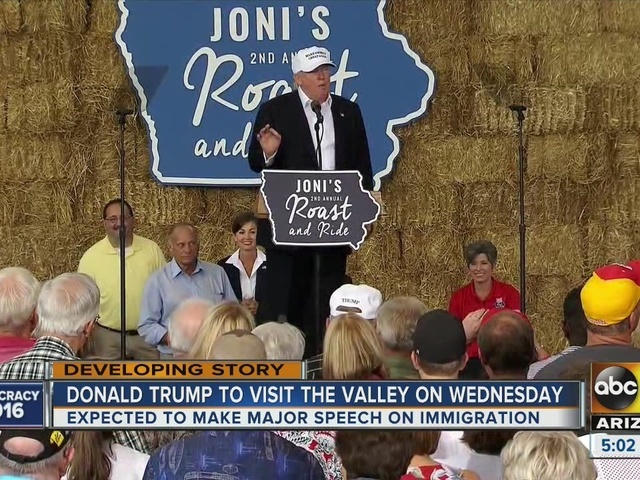 This will mark Trump's fifth visit to the Valley. Trump's vice presidential pick, Mike Pence, will also be in Phoenix, a Pence spokesman confirmed to ABC15. ABC15 learned Governor Doug Ducey will be delivering the opening remarks at Trump's rally. ABC15 has also learned Sheriff Joe Arpaio will be addressing the crowd ahead of Trump's speech. Doors are set to open at 3 p.m. at the Wednesday event. You can register for tickets here .